"I got this recipe years ago from a friend of a friend. I love it and make it all the time for parties. It looks great on the platter, and it is super easy! Everyone loves it!" In a medium bowl, mix together cream cheese, dressing mix and mayonnaise. 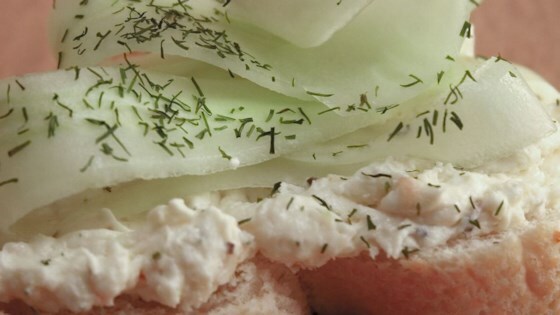 Spread a thin layer of the cream cheese mixture on a slice of bread, and top with a slice of cucumber. Sprinkle with dill. Repeat with remaining ingredients. This simple, creamy appetizer takes its cue from English tea sandwiches. Pretty, refreshing, delicious and simple to make. Thanks for sharing!